Return to Home > Pro-Gezondheid>Olimp - GOLD-VIT C® 500 PLUS - 30 caps. 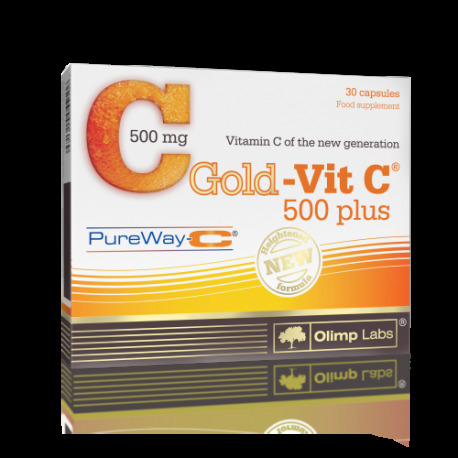 Olimp - GOLD-VIT C® 500 PLUS - 30 caps. The product is a microcapsule complex of L-ascorbin acid and natural plant waxes (fatty acid metabolites) enriched with citrus bioflavonoids, which support the immune system, and is stomach-friendly. 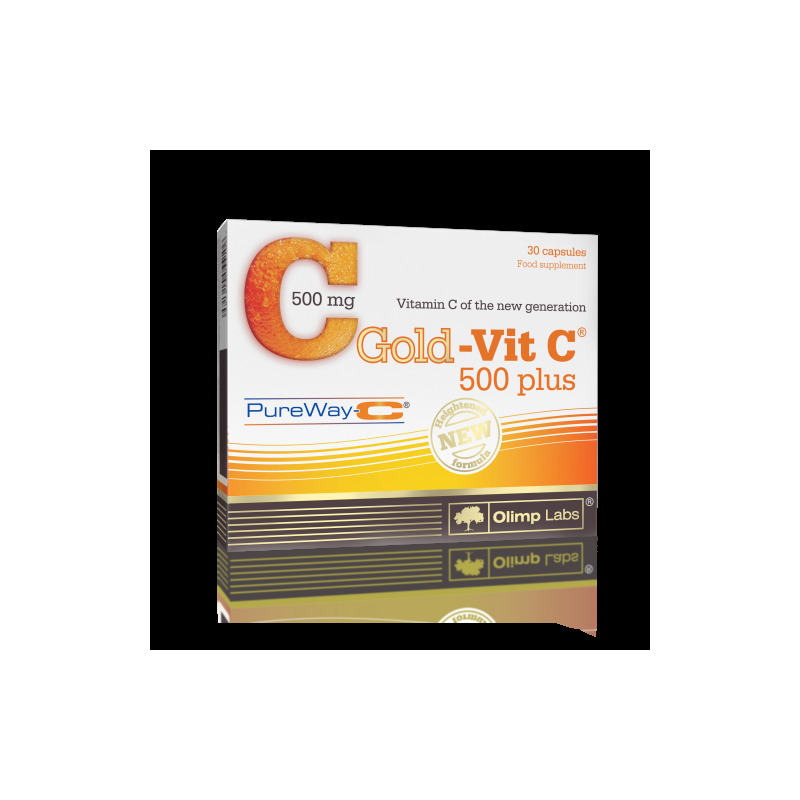 Gold-Vit C® 500 Forte is a highly-absorbable and rich source of vitamin C which in combination with citrus bioflavonoid extract creates a unique vitamin C complex [PureWay-C®] of the highest quality. Recent scientific research has shown the advantages of this ultra-innovative form of vitamin C in the form of fatty acid metabolites (PureWay-C®) over the forms of vitamin C already available on the market – ascorbic acid, calcium ascorbate and calcium ascorbate/threonate (Ester-C®). This innovative form of vitamin C is absorbed significantly quicker, demonstrating extremely beneficial kinetics in rapid time. Fatty acid metabolites of vitamin C (Pure Way-C®) pass from the gastrointestinal tract to the bloodstream extremely quickly, from where the active vitamin C can be easily distributed to the cells. In a clinical trial performed on a group of healthy volunteers, an advantage has been demonstrated in the absorption rapidity of fatty acid metabolites of vitamin C over other forms of this vitamin when compared to the control group. In comparison to the other forms of vitamin C available on the market Pure Way-C® is the most beneficial and fastest form of this extremely necessary molecule for the body’s activity. What differentiates fat metabolites from other forms of vitamin C is also antioxidant capacity of PureWay-C® and its ability to sweep away free radicals. The ability of sweeping away free radicals has been examined be means of analyzing the DPPH reduction level, which made it possible to assess how efficient vitamin C fat metabolites are in fighting free radicals. The product is meant to be used in time of reduced immunity (autumn-winter season), increased requirement of C (because of stress, smoking, or old age),intense physical activity, and as a preventive measure. Recommended use: 1 capsule a day after main meal or else as prescribed by a physician.